An upright, semi-evergreen tree with glossy green foliage with silver undersides. 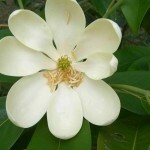 It blooms in the early summer with creamy-white lemon-scented flowers. Prefers constantly moist soils and will tolerate swampy conditions. The species is native to the eastern U.S. 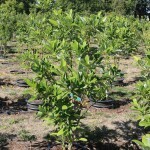 It is also known as Magnolia virginiana 'Jim Wilson'.